This window is displayed when you choose the Quick Edit command from the Tools menu to open a file with the internal quick editor of AB Commander. 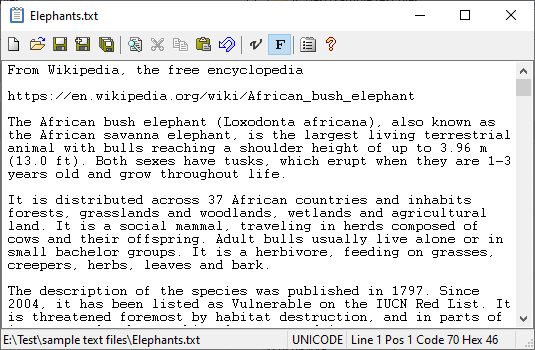 You can use this window to view and edit the contents of text files without launching a separate text editor. The toolbar of this window contains buttons that you can press to perform the usual file operations such as open and save the file, to cut, copy and paste information to/from the Windows Clipboard, to find and, optionally, replace text in the file being edited. You can also change the font used to display the text of the currently open file to a variable width font or to a fixed width font by pressing the V and F buttons on the toolbar, respectively. Finally, you can press the Options button to open the Options for Internal Quick Editor dialog box that you can use to customize the appearance and operation of the Quick Editor window. Quick Editor is designed to be used primarily with the files located in the real folders. It can also be used with files in some virtual folders, too. For example, some external devices, when connected to the PC, appear in the This PC folder without a drive letter. (Windows Phone is an example of such a device.) Another example is the Zip archives: they appear as virtual folders to Windows Explorer and AB Commander. You can use Quick Editor to view the text files located in such virtual folders. Note that the implementions of the virtual folders are often incomplete. For example, while it might be possible to view a text file, the virtual folder may not be designed by its software vendor to allow saving of the files directly back to it. To work around such a limitation, it could be possible to save the modified text to a temporary file in a real folder, and then move that file to the destination virtual folder using the usual drag-and-drop method.